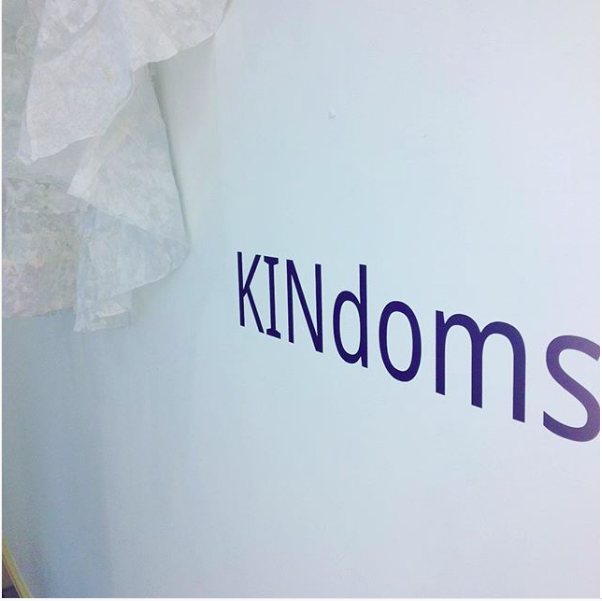 KINdoms: Textiling with the more-than-human is an exploration of the mesh of plant, animal, mineral and human networks across time, place and material states. It is inspired by concepts around the ‘vibrancy of matter’ and draws on New Materialist, eco-feminist and eco-phenomenologist theories. These approaches seek to dispense with hierarchies between humans, ecosystems and all creatures great and small. Indeed, creatures are but one category and sometimes the small is infinitely unknowable to the human eye but perceptible to other senses. When we are attentive we may encounter the vibrant matter around us, and we can respond. Just as there are no fixed boundaries between ecosystems, so there are no limits to the ‘porous nature of things’ (Jane Bennett). Matter converges and dissipates and humans are one of many active agents in this process. As the unchecked effects of the dominant post-industrial complex mark the epoch of the Anthropocene there is an emerging sense of urgency, a call to activism as the human species is exposed, found to be completely interdependent with other species. Textiles embody this material and, sometimes, uncannily immaterial convergence of diverse elements. The more-than-human network embedded within cloth is legible but sometimes its actual materiality is only a trace, a stitch, a faded colour, the spectre of a sentient being, a mapping of cosmic and weather patterns. 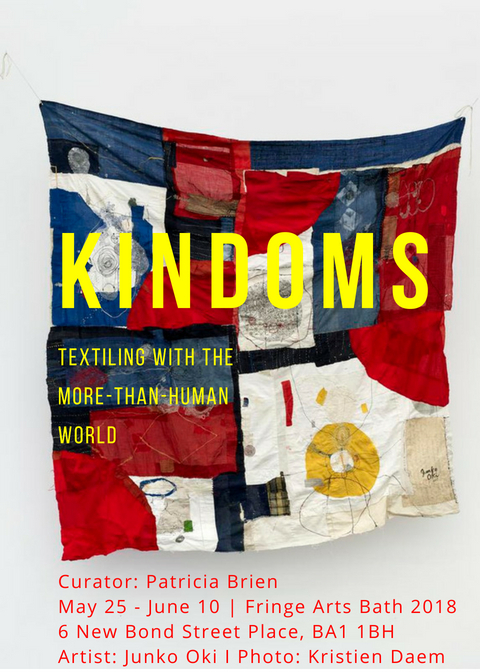 We are enmeshed in textile material cultures: on (and in) our bodies, where we dwell, as we move through the world. The themes that have surfaced in KINdoms acknowledge the complexity of relations between human geographies and more-than-human ecosystems both real and imagined. There are places and practices invoking emotional attachment, hauntings, resistance, imagination, mourning and solace. There is a strong current of time folding upon itself as the past, present and future coexist as parallel layers within a material object. The folding, working, mending, movement and dance conveyed through techniques including stitch, weave, dye, decomposition, recycling, and film embody processes that aren’t always immediately evident. While we may be cognisant of the cultural, political, economic and gendered relations evidenced in material objects we might reconsider our own relations beyond human networks, expanding and merging in ‘the flesh of the world’ (Merleau-Ponty). 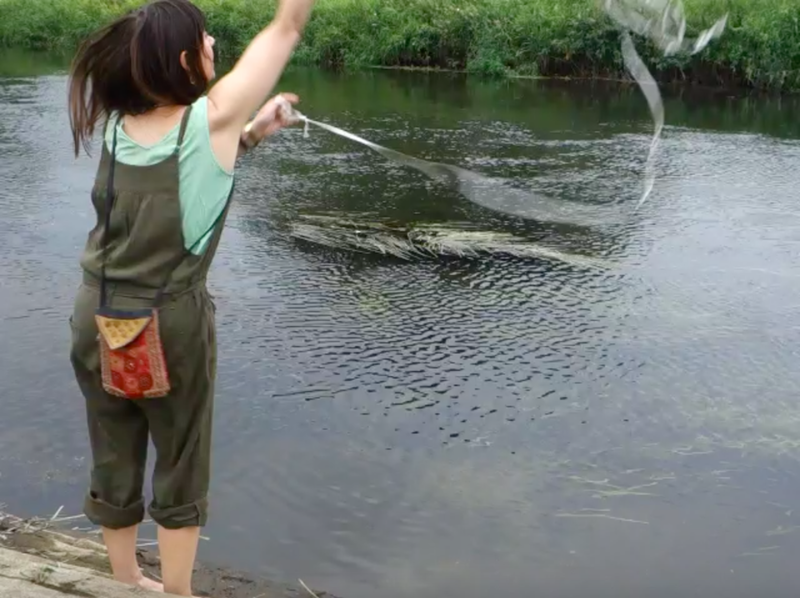 This project was an initial 'summer travelling' piece after I received Sabine Kussmaul's elastics kit to work with them in my own practice. Kussmaul is a UK-based German artist (www.sabinekussmaul.com) who's work features sketching, video, photography and the natural world. My work with the elastics was an exploration of the game of 'elastics' that I played as a child where several children would hold the elongated elastic band and we would skip, jump, and flip through the bendy elastic lines, the level of difficulty rising as the elastic band wound it's way up our bodies in synchronicity. It was super fun! In this instance, as part of my practice with the more than human world, I am playing with water, air, plantlife, temperature and sunlight on the banks of the Niers in NL where we visit regularly. It is a place of much significance for my partner who comes from this part of the world and the Niers is a very lovely river indeed, one of the only rivers in NL that maintains its own flow pattern rather than being 'directed' by human animals.